From the add-in’s Failed Tests tool window you can navigate to source code of a failed test. From the same tool window, you can re-run tests failed in a TeamCity build locally with ReSharper. 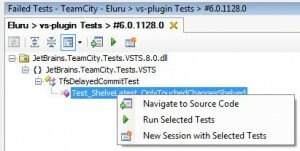 Note, that by “tests” we mean all kinds of tests supported by TeamCity and ReSharper. This feature is just the beginning, we plan to greatly improve TeamCity integration with ReSharper, so there’s more features to come. As usual, we’re looking forward to your feedback and all the feature requests are trully appreciated. This entry was posted in Features and tagged .NET, R#, Unit Tests, Visual Studio. Bookmark the permalink.